Meet Jelly Bean. 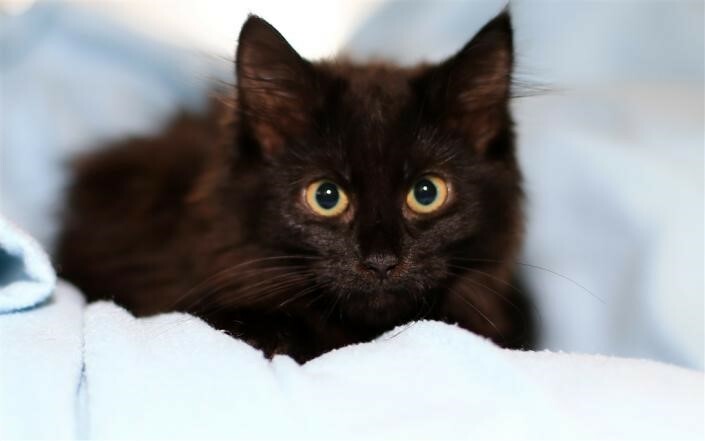 This black button-faced beauty is just 3 months old and looking for her forever home … preferably somebody who can give her a daily brushing of her gorgeous fur. She’s among more than 500 cats at the Lost Dogs’ Home. We are packed to the rafters. Until the end of January, kittens are half price and all cats over six months are free to loving forever homes. If you’re ready to welcome a new pet into your home, see some of our friendliest cats up for adoption here. While our cat adoptions room may not look full, we have almost 100 cats waiting to be de-sexed and hundreds of kittens in foster care. We are always looking for more foster carers to help us care for the large amount of cats during this peak breeding season. If you can’t adopt a cat at the moment, please help us sharing the news with your friends and relatives. One of them might be considering the possibility to have the loving company of a cat in their lives.